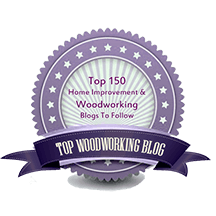 The question of chisel geometry for chopping out dovetails has received a lot of attention. This is one of those woodworking matters that I think lends itself to analysis and I think a reasonable conclusion can be reached. The problem, as I see it, is that almost all chisel manufacturers are ignoring a sensible solution. Here’s my breakdown. The concern has to do with the sides of the chisel. It is said that if the sides of the chisel meet the back in a relatively wide bevel (the height of the side), the tool will not properly fit into the recess between tails and thus will damage the walls of the tails. This is true if the sides meet the back at a 90 degree angle, as in almost all chisels, though only for the tail portion of the joint where the angle to be chopped and trimmed is less than 90 degrees, typically 80-83 degrees. This is not an issue for chopping and trimming pins since the wall of a pin meets the base of the socket at 90 degrees. An influencing factor is the saw kerf for the tail ideally reaches exactly to the baseline, in which case is does provide sufficient clearance for some square-sided chisels. However, I certainly cannot consistently stop my saw kerfs so precisely; can anyone? There’s also a problem with damaging the walls of the tail socket when simply cleaning it up. A recent review of chisels in Fine Woodworking magazine, issue #200, gives measurements of the height of the side flat (to the thousandth of an inch!) for each of 23 chisels, noting that a short side is an important desirable factor in choosing a chisel. The angle of the sides is not specified. I guess they are all 90 degrees. As the side height of the chisel gets very short, it is unfriendly to handle. David Charlesworth provides an excellent discussion of this issue on page 116 of A Guide to Hand Tools and Methods. He discusses a sensible method to use a square-sided chisel to chop and clean up tails. 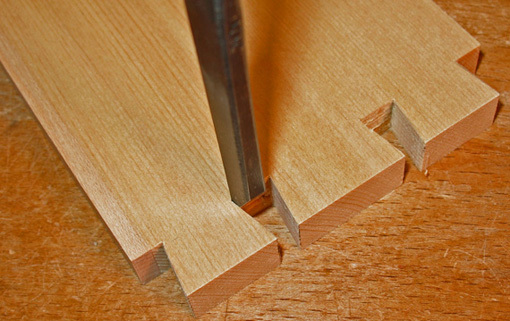 However, the method of making a “release cut” may be difficult for narrow-pin dovetail layouts. He also mentions and diagrams a “custom” ground chisel with sides at 80 degrees. There’s a simple solution to all this: chisel makers could just make the sides of the chisel at 78 degrees to the back. Why on earth don’t chisel manufacturers make this type of design available? There is no need to have sides that are .025″ high, or .010″ (ouch). Just make the sides a comfy 3/32″-1/8″ high and at 78 degrees to the back. This will work for dovetails as steep as 5:1. Since tail sockets are usually narrow, a set of 1/8, 1/4, 3/8, and maybe ½ inch, chisels with this configuration is all you need for the tails. Thickness of such a chisel would reasonably be about 1/8″-5/32″ for the smaller sizes, and perhaps 3/16 for the largest size. Problem solved. Chop and trim the base of your tails with this type of chisel. I use a Japanese version. You would not need to custom grind them and these chisels would be just fine for general bench chisel work. In the meantime, Hida Tool carries a chisel of this sort. Go to Woodworking>Chisels. Scroll down to the “arinomi” chisels. The sides are at 75 degrees to the back. You raise a valid point and one that could apply to many tools that are currently manufactured and marketed. It seems that tradition and inertia often account for far more than critical analysis of users’ needs. Yes, in many cases I would agree. 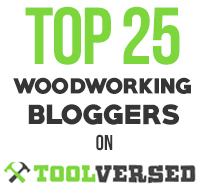 Fortunately, there are now many hand tool makers that are on a mission to improve tool design. Among these are Veritas Tools http://www.leevalley.com/ where they seem to like to rethink design from scratch and Gramercy Tools http://www.toolsforworkingwood.com/ where Joel absorbs the long history of a tool, understands why things were made in a certain way, and then takes the next step to refine the design. Lie-Nielsen http://www.lie-nielsen.com/ takes old designs but improves upon them and executes them superbly.